The public house on the corner of Hatfield and Sutton roads has an unusual name, behind which lies an interesting tale. For once there is more truth than fiction. Until this pub was copleted in 1927 Fleetville was a dry district. 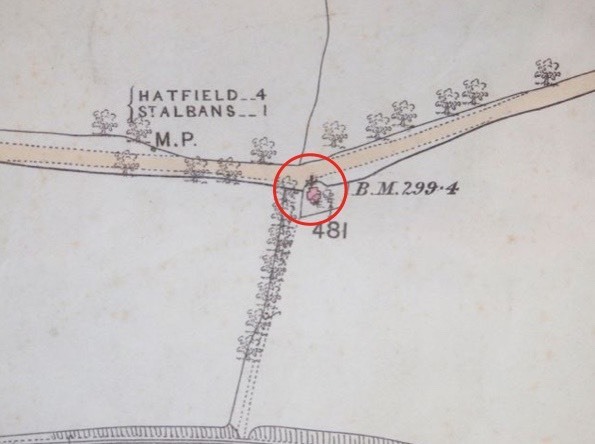 From at least as far back as 1768 Hatfield Road was part of the Reading & Hatfield Turnpike, with a Trust headquarters at the Reading end. There were several toll houses on the side roads, at which people paid the appropriate fee, if required, before entering the turnpike road. 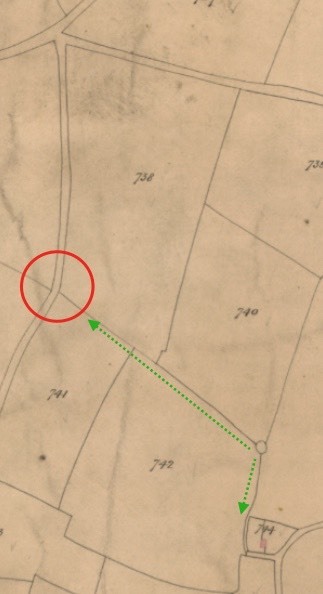 The nearest toll houses to Fleetville (although that community did not exist until after the road had been de-turnpiked) were at Colney Heath Lane and Camp Road, the latter at the location we know today as The Crown. 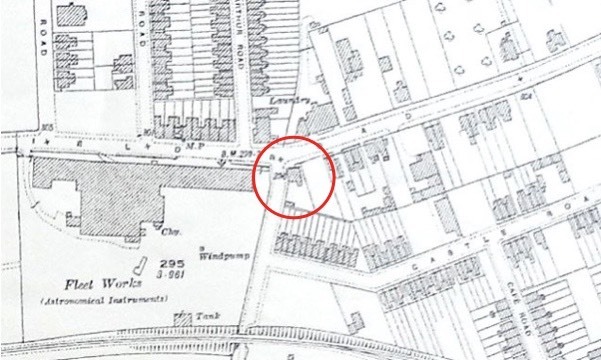 There were no toll houses at the privately owned Beaumonts Avenue, the track opposite (now Ashley Road), or the track which is now Sutton Road. All of these were farm ways. So far, there is no known reason for a lack of a toll at the Beaumonts junction, although it was possible to get farm animals, produce and crops to the town via the untold Sandpit Lane. The first map in the Gallery on this page is taken from the 1840 tithe map. Hatfield Road (top to bottom) lies to the left of field 738, called Broad Field. The boundary between 738 and 741 is now Sutton Road. 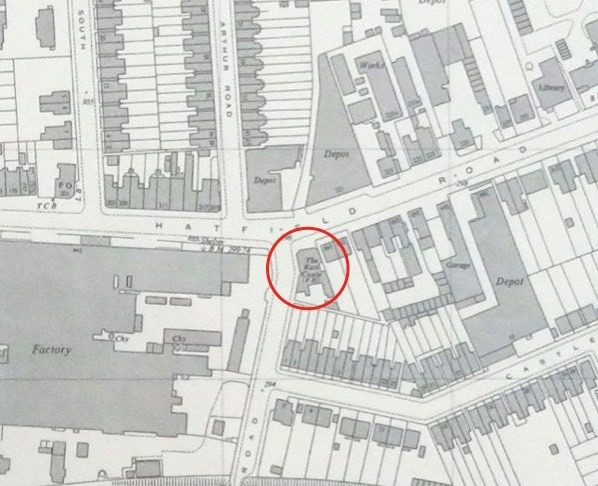 There is no sign of a building on the corner inside the red circle, so we can presume no building existed here at that time. 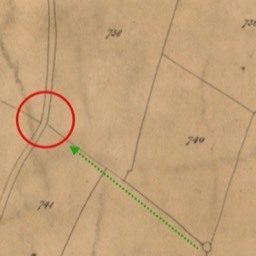 During the 1840s the Turnpike Trust became concerned that a number of travellers using Camp Lane (Camp Road today) were avoiding the toll payment at the Camp Road toll house by taking a short cut at the boundary of Beaumonts Farm, from Camp Lane (bottom right of the tithe map) towards Hatfield Road, via the green arrows shown. It is not known whether these movements had the tacit permission of the land owner, Thomas Kinder. 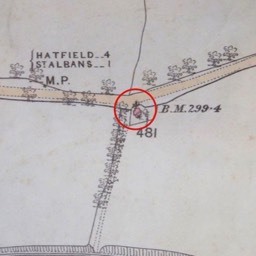 The Trust, presumably with Kinder's permission, erected a simple toll house on the corner, within the red circle. In plan it was cross shaped, possibly with brick walls, and certainly with a thatched roof. The Colney Heath Lane and Camp Road toll houses also had thatched roofs, and an eye-witness also confirms this. 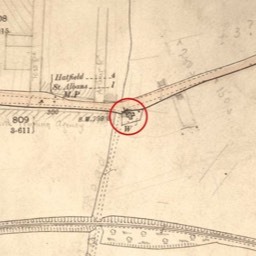 Although not clear in this version, the next map available, 1879, does show the toll house and, for the first time, the field boundary is shown as a track. 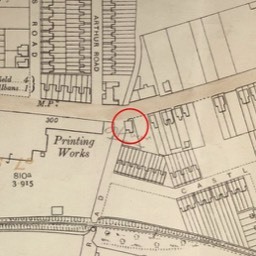 The next map, 1898, also shows the same building, but by then it would have been out of use. Don't get confused; the tithe map has north to the left of the map, while all other maps are conventionally presented with north towards the top. 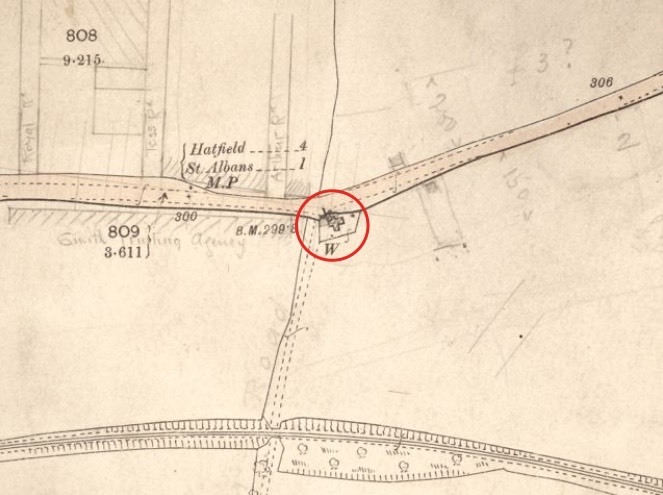 By the time of the 1898 map, the toll house had been empty and neglected for 17 years, the Turnpike Trust having been handed over to the Highways Board. The final tolls had been collected in November 1881. The building is unlikely to have been considered very positively by local people, given that many of them would have, in effect, paid a tax to use the Hatfield road in previous times. The decaying building became infested with rats which, reportedly, netted in the roof thatch. Again, this was attested from an eye-witness account. Thus grew the sobrequet The Rats' Castle; the structure possibly being considered a monument to other 'rats' whose wealth might have built themselves the equivalent of castles elsewhere, paid for by the poor parishioners. A further events had occurred in 1881. Thomas Kinder, owner of Beaumonts Farm, on which the toll house was built, died. Between then and 1899 when the first part of the farm was sold for development, local farmers rented fields at Beaumonts for their own uses. The new temporary farm tenant of Broad Field may have had no reason to retain the field's historic name. Instead he, and possibly people known in the area, adopted the name Rats' Castle Field. Certainly the name caught on in the local vocabulary. Note: an error in St Albans' Own East End: Insiders, page 147, the date of 1878 for Primrose Cottage should read 1898. Primrose Cottage was finished too late to be shown on the 1898 map, which still had the old toll house in place; and the 1812 map, which was based on the 1898 version rather than use a new survey, was no more up to date. 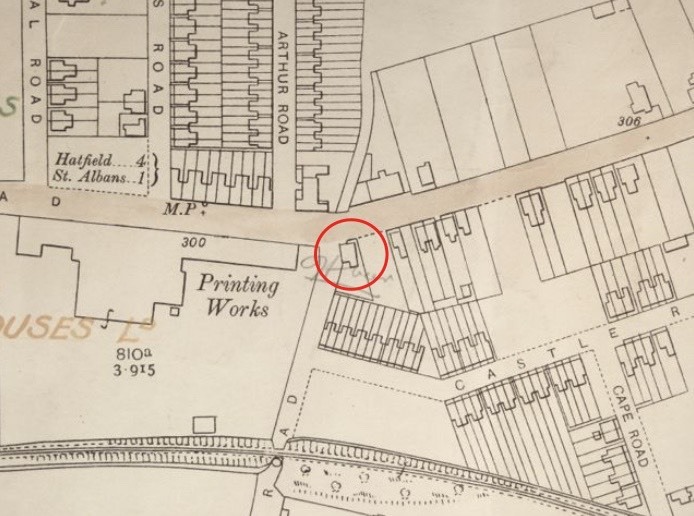 Primrose Cottage was shown for the first time on the 1924 map. The earliest discovered reference to Rats' Castle is in a report about a fatal accident [Herts Advertiser August 17th 1878]. James Harris was killed falling from a cart near Oaklands. Prior to this, "At Rats' Castle they sold some herrings, and then proceeded on the road to Hatfield." So the Rats' Castle name dates to at least 1878, and maybe earlier. 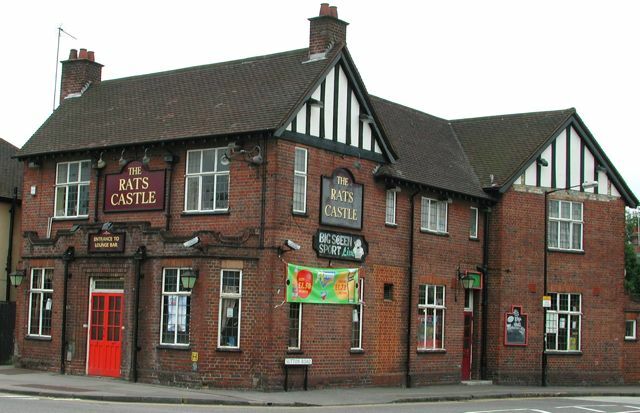 Meanwhile, the field known as Rats' Castle Field was developed, and the road which passed through it was named Castle Road. 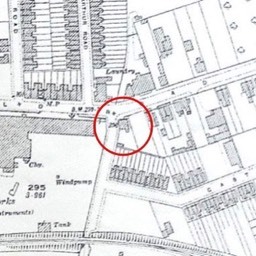 The 1891 census also illustrates the fact that the name Rats' Castle had become a colloquial name for the specific area around the old toll house, not just the little building itself. The public house replaced Primrose Cottage in 1927 (opened 1929), having been acquired by Benskins Ltd, brewers. Designed by Percival Cherry Blow, a local architect of some note, readers may notice some similarity between the Hatfield Road frontage of the old and new buildings. The 1964 map shows the larger and more complex shape of the pub building compared with either of the previous structures. The 1891 census describes the enumerator's route as including the Rats' Castle. Whether this related to a specific building, or a small area, is uncertain. But since the toll house was empty at the time, either way it should have been written up as "Old toll house, uninhabited." As it was referred to in the route, it was probably a simple error of omission that the building was not listed in its correct geographic location. The 1899 street directory names Mr T Cooke as occupier for the new house, Primrose Cottage. However, in 1900 and 1901 the building already appears to have taken on the name Rats' Castle from the given name of the former toll house. It is sometimes difficult to shape off old names. 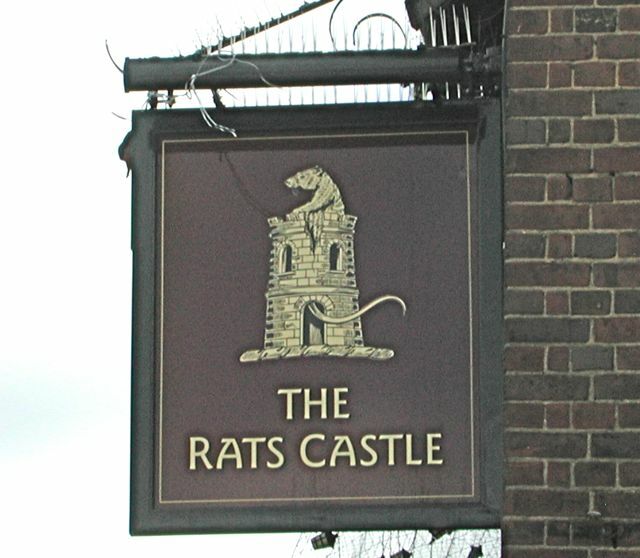 Since there is no further reference to the Rats' Castle until the public house opened in 1929, it seems more likely that the early Rats' Castle references resulted from uninformed directory compilers than an official rename. 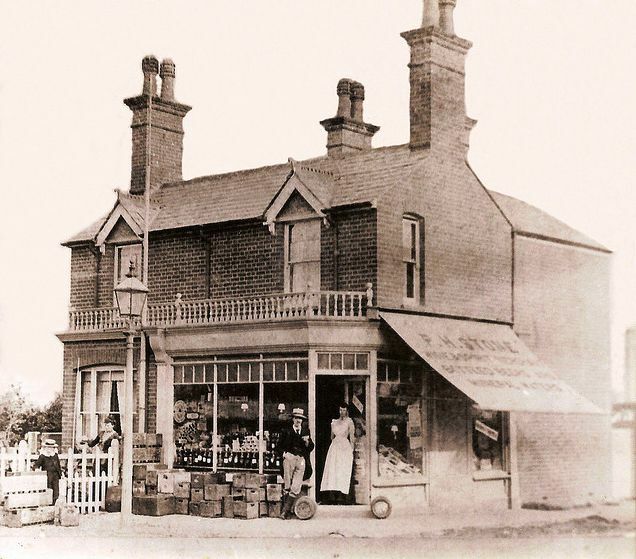 The premises were taken on by Percy Herbert Stone in 1902, and by Mr P A Perkins in 1905 after Mr Stone moved to shop premises nearby in Bycullah Terrace. The 1901 census does not include Rats' Castle in the enumerator's route as had been the case in 1891. This may reflect the fact that other names, such as roads and works buildings, were, by then, more important. Building was taking place in Castle Road, and this road with its completed houses were listed. There was no reference to Primrose Cottage, but the Institute (workers' club) and the Fleet Works were mentioned. Also listed here was one unoccupied house. This may have been Primrose Cottage; Mr Cooke having moved out,, but Mr Stone not yet arrived. Further evidence is sought for this unsubstantiated information. Mr C E Griffin took the shop in 1909, but by 1911 Mr George W Hopkins occupied it until it closed for rebuilding by Benskins in 1927. Mr Hopkins was actually a brick maker. There were several brick works around, so we must be careful not to assume he worked at the nearest, which was Owen's, along the Ashpath, now Ashley Road, although he may have done. His wife, Ada, was a sweet shop manager, according to the census, and this would have been at the Primrose Cottage shop. The premises were also licensed for the sale of spirits, but in larger bottles only, and for consumption off the premises. The circle encloses the name Rats' Castle. 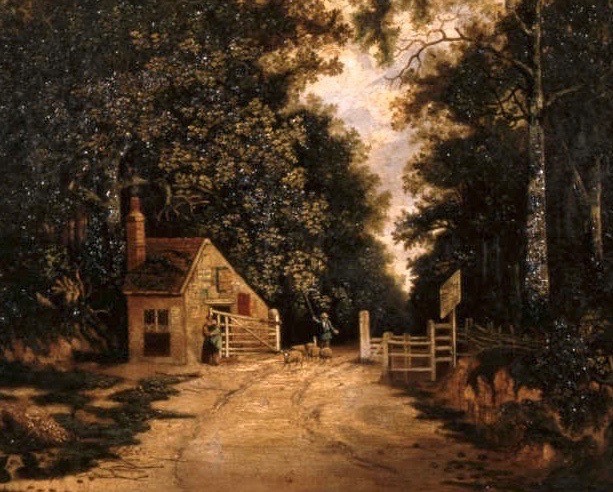 The Colney Heath Lane Toll House, painted by John Westall, had a five-bar gate. No evidence has been found for a gate or a chain, or any other barrier at the Rats' Castle. In the absence of any images of the Rats' Castle toll house the backdrop image on this page shows a thatched roof toll house at Stanton Drew, Somerset. Photo courtesy Jonathan Billinger. "What a long way it seemed to Rats' Castle, the little tumble-down shanty with the thatched roof." Correspondent to the Herts Advertiser, 1922. Primrose Cottage, the first shop in Fleetville, with living accommodation to the left. A correspondent writing in 1922 to the Herts Advertiser, recalled making a journey along Hatfield Road from The Crown when she was much younger and the toll house was still extant: "… taking a stroll along the Hatfield road and recall the hedge around the field, with the dip behind and the pond in the corner, where Clarence Park now is. There were no houses beyond that point for some distance. What a long way it seemed to Rats' Castle, the little tumble-down shanty with the thatched roof. 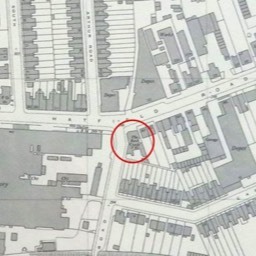 This of course stood at the corner of what is now Sutton Road." A similarly small toll house at the entrance to Colney Heath Lane. No illustrations of the Rats' Castle toll house are known to exist. A monograph illustration on a 1980s sign. 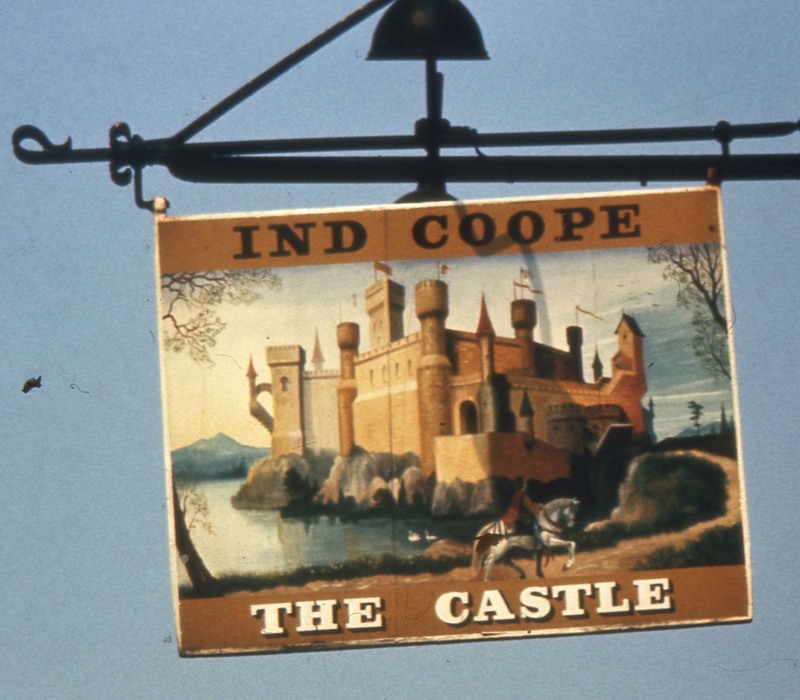 A short-lived version in which the name was abbreviated to The Castle, much to the horror of many regular drinkers, and some residents too. It reverted to the full title after a short time.